MHHEFA issues tax-exempt revenue bonds to assist private, non-profit higher educational institutions and licensed non-profit healthcare providers with low cost financing for capital projects. Pool Loan Program - Pool Loans make it cost effective for most borrowers that need to borrow as little as $600,000 to issue bonds. MHHEFA groups several loans of varying amounts together into a single bond issue, where bond issuance costs are shared by all participants. The Moody's rating of Aa2 and Fitch Rating of AA for the Pool Loan Program resulting in lower cost of issuance as well as ongoing interest expenses. Conduit Loan Program - Conduit Bond Issues are available for borrowers should circumstances exist that would preclude a Pool loan. Conduit Bond Issues are issued solely on the credit strength of the individual borrower. Proceeds from the bond issuance may be used to finance construction, expansion, and renovation projects, facility acquisition, refinancing of existing debt and to pay costs of issuance. 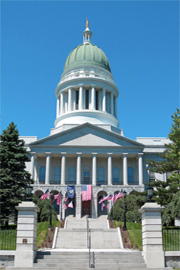 Interest paid on most MHHEFA bonds are exempt from both federal and Maine State income taxes. For a list of authority fees for all MHHEFA programs, please click here. Financing can include up to 100% of the project costs, including land acquisition (as part of the proposed project), construction, renovation and remodeling, architectural fees, legal fees, bond issuance expenses, Authority fees, and any surveys or studies performed. All proposed bond issues must be reviewed and approved by MHHEFA’s Board of Directors. The borrowing institution’s financial and management information must be presented to the rating agencies (Moody’s, Standard & Poors and/or Fitch). The ratings issued by these agencies have a material affect on the marketing of the bonds to potential investors. MHHEFA staff assist eligible borrowers by reviewing the organization’s current and projected financing needs and help the borrower determine the best approach to funding a capital project. This financial advisory service is available to all eligible borrowers even if the Authority is not the ultimate issuer of the financing. Commited to providing the best energy supply rates, Maine PowerOptions is an energy-purchasing consortium that serves as an aggregator for Maine's local governmental and non-profit organizations. Come to our homepage and see what benefits your organization or facility could enjoy by becoming a member.